After getting tons of emails and comments about the green tape seen on my gear, I have decided its time I share my uses of gaffer’s tape. 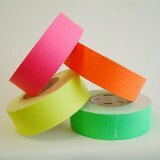 Gaffer’s tape is a strong adhesive tape that does not leave a sticky residue when used. It is also heat resistant. I have come to swear by the stuff, and wanted to share how I use it as a camera operator. By putting some gaffe tape on the bottom of your camera you can protect it from tripod plate scratches. I also add a few black pieces on camera edges and corners to keep them from getting damaged (card door, area around hot shoe etc.). Its easy to accidentally bump the settings dial and change it from the manual (the “M”) to another undesirable setting, so I put a very thin strip of green tape that points to manual. That way I can tell I am on the right mode with a simple glance. By putting bright green tape on the bottom of your camera you can find the 1/4″ tripod hole much easier in dark shooting conditions. As you work with other operators, rental gear, and especially other HDSLR shooters, you will find it can be difficult to tell who’s gear is who’s after a long production day. A simple solution to this is picking a color of gaffe tape, and adding it to your gear. In my case green (as is evident from my podcasts). Its also useful from keeping track of bags and case, just grab a strip of white gaffe tape and use a sharpie. Many of my lenses have focus marks on the barrel of the lens. So a lot of the time I use gaffe tape to mark off focus points to get more accurate focus pulls (Trick I learn here). Gaffe Tape is heat resistant, and we use A LOT of Arri Fresnel kits . So I use gaffe tape for various lighting tasks like taping barn doors, securing loose locks, attaching awkward filters, patching filter holes, etc. Because gaffe tape does not leave a sticky residue like duck tape, you can use it to secure cables to floors, tripods, and sometimes walls without fear of making of mess. Does that mic look like it is slipping from the stand? Gaffe it. Is that battery pack loose? Gaffe it. If you work in the narrative film world, you may have used gaffe tape to adjust the talents wardrobe. If an actors sleeve looks to puffy just take a little gaffe tape and tighten it up. I hope I’ve turned you into a believer. I have only barely touched on a few uses of gaffer’s tape. It is definitely one of the most important tools you can have going into production. That said, you can get your gaffe tape in many colors, sizes, and length via the link below. Happy Gaffing! Purchases via our affiliate links in this article support DSLR Video Shooter at no cost to you. Thank You. QuickTime File: DSLR Video Shooter Episode #015. How does the T3i compair to the 60D. It’s it a better value because it now has the variable LCD and a lower price point? is the build quality better then the t2i? the t2i was plasticy. Have you done or would you do a video on your work-flow from when shoot to the final project along with the editing set up you use. I will be doing some workflow video before too long. When I see a lot of gaffer’s tape, I quickly and carefully move the opposite direction; gaffer’s tape is a sure sign that something was improperly done.